Grays Hockey Bags are new and improved for the 2017/18 season. They are well designed, practical and can carry everything an athlete needs for a match day. 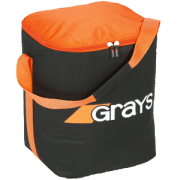 With allotted sections for kit and sticks you can make sure all your gear stays dry and organised in the Grays luggage range. Grays have produced a range of hockey bags designed to maximize storage space for players of all levels. Often with two large storage compartments, as well as a smaller pockets for valuables and a drawstring pouches perfect for holding water bottles. The best Grays Hockey bags often have space for up to four hockey sticks with padding to keep them from becoming damaged in transit. Adjustable straps also makes carrying their bags a breeze! You can get all your hockey equipment for the season and benefit from All Rounder Hockey’s unique finance plan on orders over £100, and keep it all in good condition with Grays' luggage range.